We recommend checking out our discussion threads on the ASUS RT-N56U Dual-Band Wireless N600 Gigabit Router RT-N56U, which address similar problems with connecting and setting up Wireless Routers ASUS. The user manual for the ASUS RT-N56U Dual-Band Wireless N600 Gigabit Router RT-N56U provides necessary instructions for the proper use of the product Computers & Solutions - Networking - Wireless Routers. The Dual Band Wireless-N Gigabit Router from Asus is a versatile, high-performance router designed to effectively work with a wide variety of wireless and wired devices on your network. This router can connect to your wireless N, B, and G devices and operates on both the 2.4GHz and 5GHz bands. Operating on dual bands at the same time allows you to experience optimal data transfer speeds, so that you experience little to no lag or interference. As such, each band can transfer data concurrently at up to 300Mbps. You can surf the Internet, send emails, or download files on the 2.4GHz band and stream multimedia content, such as HD video, music, or online games on the 5GHz band. This router also utilizes a Gigabit Ethernet WAN port for connecting to your modem and features four Gigabit Ethernet LAN ports for establishing high-speed wired connections to any of your Ethernet-enabled devices. Beyond these ports, the router also has two USB 2.0 ports, which allow you to connect NAS storage devices or printers. With an easy-to-use interface, Asus's Ai Radar technology, and support for up to 300,000 data sessions, this router is a sure-shot way to brilliantly bring the Internet to your wired and wireless devices on your home or office network. If you own a ASUS wireless routers and have a user manual in electronic form, you can upload it to this website using the link on the right side of the screen. Box Dimensions (LxWxH) 12.3 x 9.3 x 3.4"
The user manual for the ASUS RT-N56U Dual-Band Wireless N600 Gigabit Router RT-N56U can be downloaded in .pdf format if it did not come with your new wireless routers, although the seller is required to supply one. It is also quite common that customers throw out the user manual with the box, or put the CD away somewhere and then can’t find it. 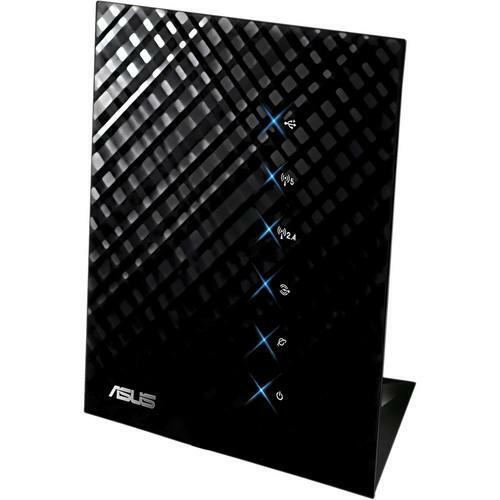 That’s why we and other ASUS users keep a unique electronic library for ASUS wireless routerss, where you can use our link to download the user manual for the ASUS RT-N56U Dual-Band Wireless N600 Gigabit Router RT-N56U. The user manual lists all of the functions of the ASUS RT-N56U Dual-Band Wireless N600 Gigabit Router RT-N56U, all the basic and advanced features and tells you how to use the wireless routers. The manual also provides troubleshooting for common problems. Even greater detail is provided by the service manual, which is not typically shipped with the product, but which can often be downloaded from ASUS service. If you want to help expand our database, you can upload a link to this website to download a user manual or service manual, ideally in .pdf format. These pages are created by you – users of the ASUS RT-N56U Dual-Band Wireless N600 Gigabit Router RT-N56U. User manuals are also available on the ASUS website under Computers & Solutions - Networking - Wireless Routers.